A 20-ha tropical seasonal rain forest in Xishuangbanna was established in 2007, with the geographical coordinate 21.61°N，101.57°E. The topography of this plot was diverse, with an elevation ranging from 709-869 m and three perennial creeks that joined together in the south-eastern corner of the plot. The mean annual temperature is 21.0℃, and the mean annual precipitation is 1532 mm. A total of 95,834 free-standing individuals with DBH ≥ 1cm were recorded in the 20 ha plot, belonging to 468 species, 213 genera and 70 families. The forest has three or four tree layers. The forest was dominated by Parashorea chinensis (Category I national protected species), up to 50-60 m high in emergent layer, and its importance value ranked second. The second and understory layers are dominated by Sloanea tomentosa, Pometia tomentosa (Category III national protected species), and Pittosporopsis kerrii etc. The four canopy dominated species exhibited size structures with Reverse-J shape, and young trees (saplings and poles) revealed a clumped spatial distribution, but adults tended to have a random distribution. Principal Investigator: Cao Min, Professor of Xishuangbanna Tropical Botanical Garden, CAS. His research focuses on tropical forest biodiversity, tropical vegetation and forest dynamics, soil seed bank ecology etc. Research Team: Deng Xiaobao, Lin Luxiang, Hu Yuehua, Yang Jie, Sun Zhenhua, Akihiro Nakamura, Li Qiaoming, Li Yuwu, Yang Xiaofei, Deng Yun, Zhang Wenfu and Dong Jinlong. Cao, M, H Zhu, H Wang, G Lan, Y Hu, S Zhou, X Deng, & J Cui. 2008. 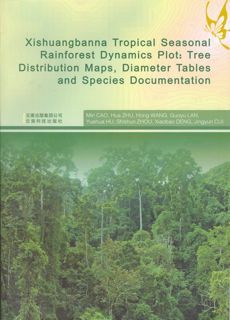 Xishuangbanna tropical seasonal rainforest dynamics plot: Tree distribution maps, diameter tables and species documentation. Yunnan Science and Technology Press, Kunming. 266 pp.